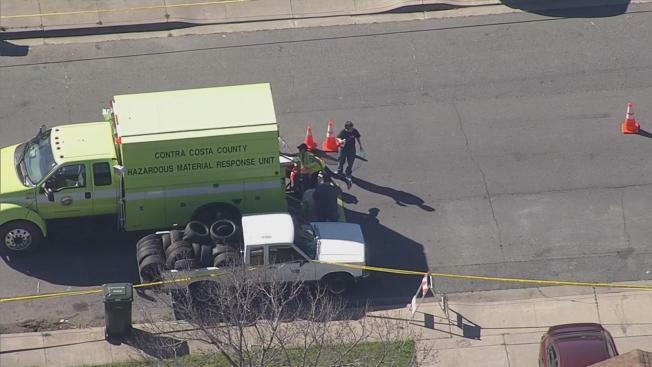 A hazardous materials crew was investigating a mercury spill in Antioch on Monday night, Contra Costa County health officials said. Contra Costa County Fire Chief Robert Marshall said the initial call reporting the incident came about 3 p.m., and fire crews responded to Manzanita Way, between Sycamore Drive and Mahogany Way. Mercury contamination was found in multiple locations in the 2200 block of Manzanita Way, according to Contra Costa County Health Services. Officials say Manzanita Way is closed to traffic while crews investigated the incident. Officials from the Environmental Protection Agency and the Department of Toxic Substances Control also were on site and expected to work through the night, health officials said. The agencies hope to partially open the road by Tuesday morning. Full clearance isn't expected until Tuesday afternoon, officials said. contamination. HazMat and USEPA on scene. Call 925-335-3200 for more info.